A teenager who stole cats from an animal sanctuary to use as "live bait" for his dogs has been sent to a young offenders institute for 30 months. Frank Lewis, 18, slit one of the cat's legs to slow it down while he used the pets in a hunting game with his dogs. 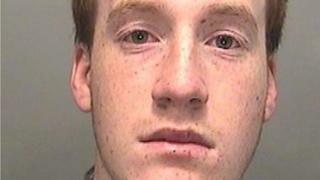 Lewis, of Croeserw, near Port Talbot, admitted burglary and killing the cats. Judge Paul Hopkins told Swansea Crown Court his acts added with his "extreme right-wing views on race and sexuality" meant he was "dangerous". The court heard the teenager broke into the purpose-built cat sanctuary late at night - and stole a cage with ten cats nursed back to health by volunteers. "Lewis essentially used the cats for sport," said Georgina Buckley, prosecuting. "He used his dogs to hunt down and kill them. He caused lacerations to the cats himself to try and hinder their escape." Ms Buckley told Swansea Crown three cats were found mauled to death in different spots near the Ty Nant Cat Sanctuary in Neath Port Talbot. Four cats were found alive and returned - but three others are still missing and presumed dead. Ms Buckley added: "Post mortem gave the cause of death as the result of an attack and having been shaken viciously by an animal, like a dog." Lewis' actions came two weeks after he was sentenced in a youth court for an attack on a sheep when he stole the animal from a field, killed it and posed for photos next to it on Facebook. "They are acts of great cruelty." Daniel Heard, defending, said Lewis accepted responsibility for the burglary and the deaths of the cats. He said: "Lewis concedes his dogs were trained to hunt and he knew full well about what the outcome would be." He added Lewis had been seen by child psychologists after decapitating the sheep and they concluded he showed "psychopathic traits" and signs of a personality disorder. A 15-year-old, who was found not to have taken part in the killing of the cats, was given a nine-month curfew order earlier this month.